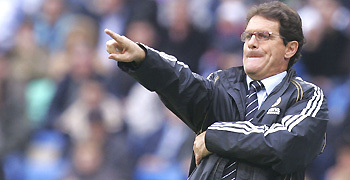 In Rome, you take your life in your hands speaking the name of Fabio Capello. "England's next manager" he may be but to fans of AS Roma he is a figure of hate. Yes, he led them to their first championship for 18 years. But he left shortly afterwards, taking some of the team with him to Juventus. And in the crazy world of Italian football that's enough to mean he'll never be forgiven. Scan the newspapers in Rome as Capello apparently heads for England and one of the biggest jobs in the game and there is not a mention of him. "We don't like what he did to us," a Roma fan tells me. "Everyone says he is a winner but for Fabio Capello, everything is about Fabio Capello." His friends here say his English is better than many people think. He will get his message across, they say. And, as for the the terror of the demanding English media, they say he'll give them short shrift. But how will he solve England's problems? One international newspaper does quote a piece Capello wrote for the Spanish paper Marca after England's defeat against Croatia. "As coaches we all ask ourselves how England failed to qualify. How can players with the quality of David Beckham and Michael Owen perform so differently when playing for their country? It is clear the shirt weighs too heavily even for these winners. "The obvious explanation is that there is a mental block. In these situations the coach's role is fundamental, he needs to be more psychologist than tactician or technician." Publicly some in Italy question how much he knows about international football. Another Italian on the FA's list, Marcello Lippi, beats him hands down on that score, having won the World Cup with Italy last year. Good luck Fabio, they say here (except the Roma fans of course), you'll need it. And of course, that £4 million a year will help along his art collection, already said to worth £10 million. Loyal followers of england... Sven goran eriksson.. yep heres our man you sang... before you changed the tune very quickly to a less then flattering rhythem.when will you realise the manager can take some of the critism but its the players that let you down ie Gazza, Waddle in 90, Southgate 96, Phil Neville 2000,Beckham 1998, Paul Robinson 2006,2007..Carson 2007, James 1990-2006,Seaman 2002... need i go on ? it wasnt the managers that did all these ... Capello England manager 2007 -2010 Will i be right? This is getting soooooo boring, The England team will still play rubbish football, because the same squad will be picked time and time again. Maybe Curbishley would have changed all that. FC is the man! He will sort the over paid prima donnas out and he will give the English press a good run for their money. They might even have a good word or two to say about him after all it is nearing the season of goodwill! If I may, and without prejudice to the achievements of many a european manager, I cannot but help the shortsightedness of the FA, as many a quality manager exists on these humble shores of ours, albeit known as the United Kingdom. The emergence of Mr F as the frontrunner, exciting as it may seem, does however fail on two counts "Simple Minds"
(1) Will the players be relaxed under such extreme measures? So, as we are again "Hypnotised" by virtue of the failings of the FA, I beg to differ with Mr F's culmination surrounding Michael Owen as no one mathces the quality this up-coming young professional has, and will continue to have for years to come. Insofar as David Beckham, again, it appears Mr F has not kept upto date with recent press, insofar as to say, the last time I looked at Mr Beckham, he was not only short of a shirt, but, well visit http://www.sky.com/news and all will be revelaed. So, FA, take a look closer to home, and Im sure Gary Linkekar will provide further moments for digestion, if gold is what we are going for. Lessons In Reporting, Italian Style. The Mosley Affair - Do You Care? Has Belgium Had It's Chips?